I would like to dedicate this one to Ice. "Towards the end of his life, in 1891, exactly one century after the death of Mozart, Brahms posed the question of how to pay homage to Mozart without surrendering one's own individuality. 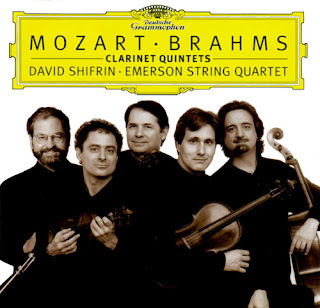 He selected a genre - the clarinet quintet - that belonged to Mozart. 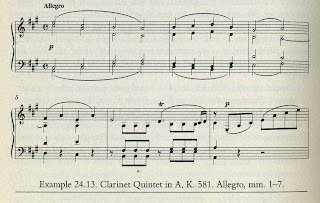 The opening theme of Brahms's slow movement yearns for Mozart, and though unable to find him, does not cease its longing (Example 24.12). It is the image of a restless romanticism questing for what has now become a classical ideal. 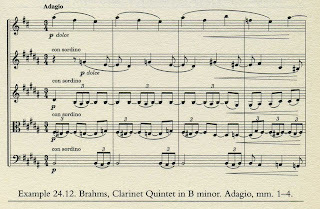 Brahms's theme appropiates the opening three notes of Mozart's Clarinet Quintet, blocking the theme, and refusing to allow it to continue, let alone to come to rest. In the end, Brahms knew, we cannot reach Mozart, we can only hope to come nearer to him. It remains to let the theme continue, as Mozart did (Example 24.13)." Can you please tell me the Passward? Thanks OOORIEL - take a look at the Prey-"Ich habe genug" post, I've added the password which I forgot when posting. Hope it works for you now! Kammermusikkammer (but quite different), I invite you to add a link to my blog in your sidebar (as you did some days before for the gone Andante Musica).